This is our tiger Mk1a that my wife, Margo, and I bought in 1998 up in Los Gatos CA. Not going to say Los Gatos is an "upscale" neigborhood, but this small town has a Ferrari, Porsche, BMW, Lexus, Cadillac, Land Rover, Jaguar and Rolls Dealership. Nice!! Not sure any other cars are owned there, except for our beauty. And it's gone South now! I looked for about two years before we found one that was in pretty much stock condition. I work all over the state of CA for and industrial coating company, so I got to look at a lot of Tigers that were for sale, I am very happy with the one I got. The car still has the 260 with 4 barrel holly and stock air cleaner. I installed new carpet, new wiring harness, and other smaller parts. 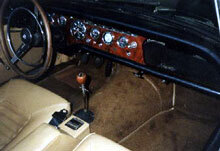 The interior is pretty stock, has amp meter, Smith gauges, and tan upholstery. The wheels are different I haven't seen them on any other Tigers. 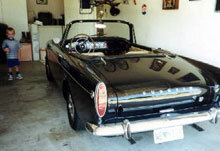 I would like to install a roll bar, dress the motor up and get some minilites for it. My two year old boy says that it's his car already. Our personalized plate stands for "we love R Tiger".